“Beauty is in the eye of the beholder” as the old saying goes. In the food world, we indulge with our eyes as well as our other senses. By plating food in a visually attractive way, an average meal can be elevated into a work of art. 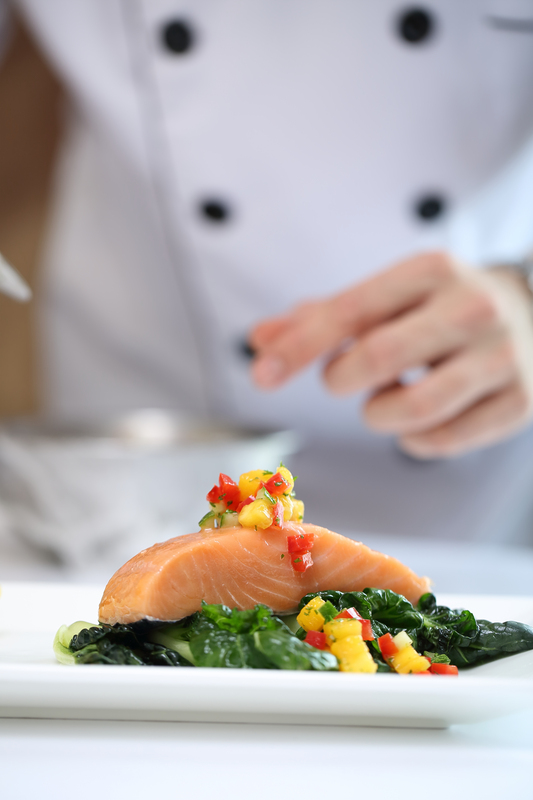 A well-plated dish certainly makes food taste better, alludes to the quality of the ingredients and the high level of care used in preparation– all allowing for a better price point to be charged as well! So what are some tips to put forth your best presentation? 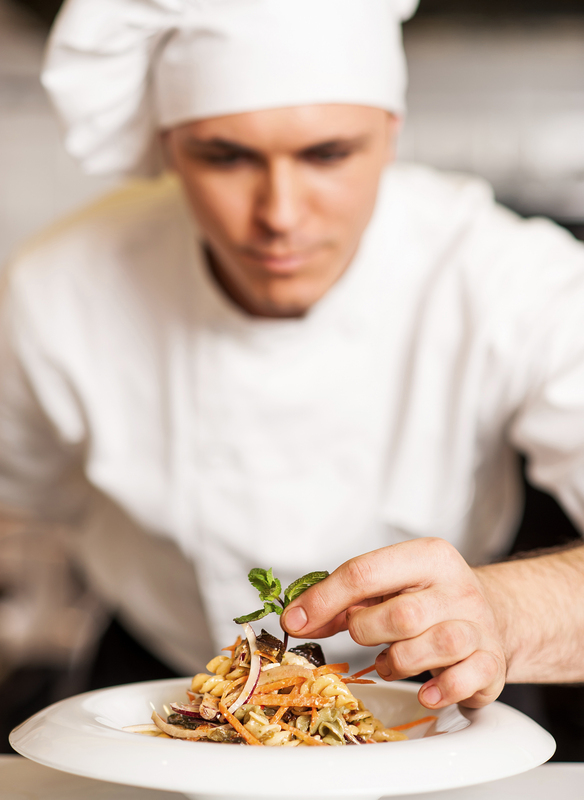 First of all, there are a couple of basic plating techniques used by professional chefs. The first is known as the Clock Method. Here, each section of the plate corresponds to a number on the clock. When using round plates, conventionally, starches are placed at 10, protein at 2, and vegetables at 6. For square plates, divide into quadrants when figuring out the placement of foods. Using this technique adds a height dimension for a 3D look that makes the food come alive. This is a good technique to use when serving smaller courses as it will make the plate look more plentiful. Stacking can be done with the use of food molds and rings or can also be done free-form to add that extra panache! Don’t be afraid to serve meat or fish on top of a bed of green beans and garnish the top with crispy fried leeks. Adding different textures will also make your dish more appealing to the senses. And, don’t forget to dress your plate with the all-important sauce. The success of any presentation also depends, in large part, how the sauce is handled. Rather than pouring sauce over your protein and covering the sizzling grill marks, pour a small pool of sauce onto the plate then place the protein on top of it. Or with the back of a spoon, swirl some sauce onto your plate. Give your swirl clean lines and be careful not to overdo it. For a different look you can also use a squirt bottle to give your sauce placement more control. Lastly, make your food come alive with color. Complement monotone-colored foods like potatoes or plain noodles with green chive accents, add red bell pepper confetti around the perimeter of the plate, a thin twist of lemon to grilled fish, or a fresh sprig of mint or edible flowers to finish off your presentation. The important thing when plating is simply to experiment with different arrangements until your creative side gives you that final nod. 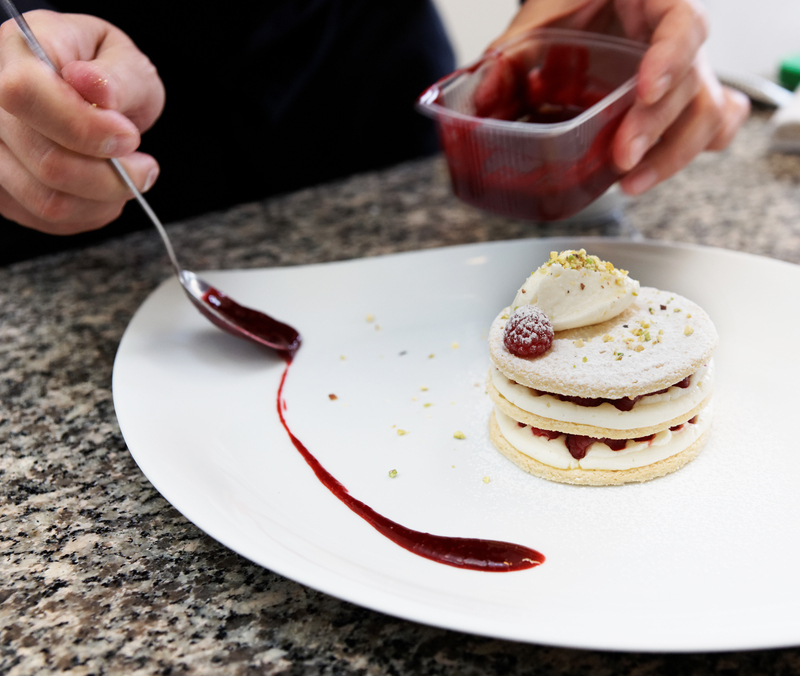 So after your creations have been savoured, guests gone and plates cleaned, choose Cambro’s Versa Dish caddies to store and protect your rounds and squares. The DCS950 holds rounds up to 9 ½” (5 columns of 45-60 each, depending on the thickness of the plate) or squares up to 8”. The DCS1125 holds larger rounds up to 11 ¼” or square plates up to 9 ½” (4 columns of 45-60 each). Both are made of durable polyethylene and can hold a 500 lb. load capacity. A vinyl cover is included for hygienic storage. 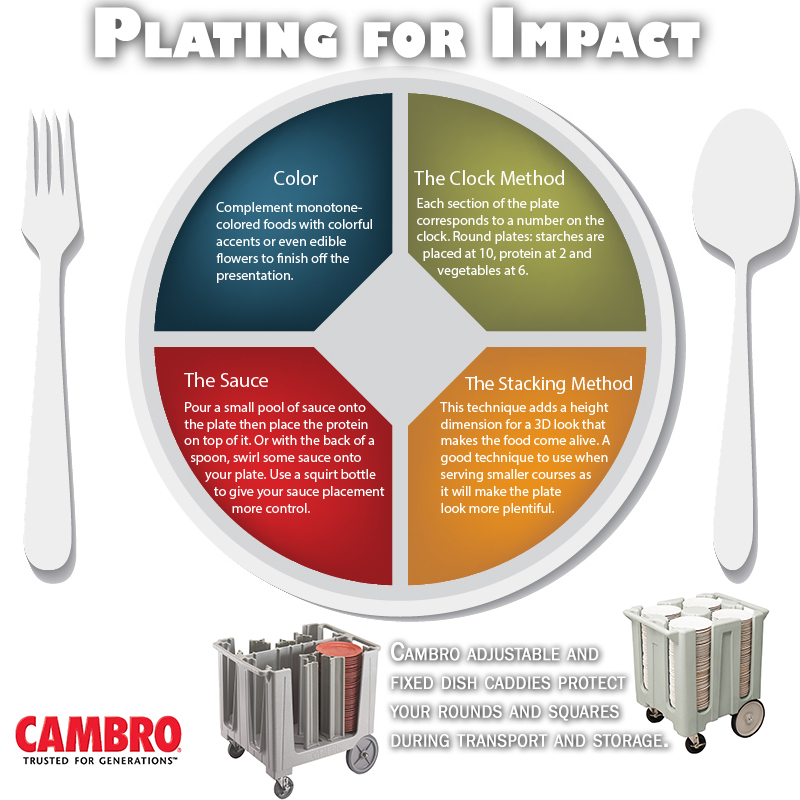 For the complete list of adjustable and fixed dish caddies from Cambro, click here or contact your Cambro representative.